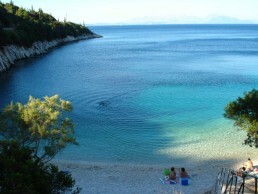 It is the busiest and most “cosmopolitan” beach of Ithaca. Filiatro is located in the south, about 10 minutes drive from Vathi. This is a sheltered bay with a turquoise sea that looks like a swimming pool. From here you can swim to two other beaches in the same bay: a very small one to the right and a much larger one to the left. 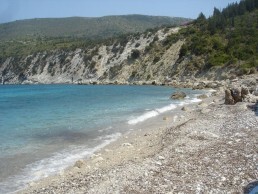 Many consider Gidaki as the most beautiful beach of Ithaca – probably for its impressive turquoise sea. 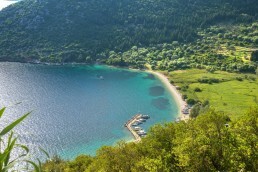 You can get there either by boat which starts from the square in Vathi, or by a path which takes 40 minutes to cross. This way is of course much more tiring, but the view of the beach from above is worth it! 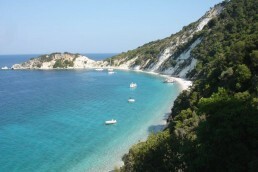 The name Kourvoulia refers to three consecutive bays encountered on the road from Frikes to Kioni. You will have to leave your car up above, descend the steps and you can then dive straight into the cool blue waters of the Ionian Sea. 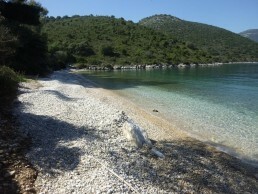 Located in the Bay of Skinos near Vathi, it is the first beach you will encounter, when coming from the capital of Ithaca. There is a paved road to the beach, the distance is not more than ten minutes, while the tall trees, mainly eucalypti, will offer you ample shade, during most hours of the day. 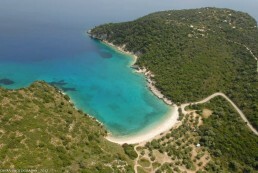 Poli is located in the bay Stavros, with its impressive turquoise sea which you can admire from above. You can take your car all the way to the edge of the shore where you will see a small canteen , as well as umbrellas and sun beds for everyone. A wild landscape surrounds the beach in Afales Bay, in northern Ithaca, with rocks and trees that reach the shore. The road (asphalted) reaches all the way down to the sea and from there you can choose one of the 4-5 beaches, depending on how much you want to walk.